The Internet is an American R&B band from Los Angeles, California. The current roster consists of former Odd Future member Syd, Matt Martians, Patrick Paige II, Christopher Smith, and Steve Lacy. The band is known for their trip-hop, neo soul sound, and have released three studio albums and three extended plays since forming in late 2011. The band's 2015 album, Ego Death, was nominated for the Grammy Award for Best Urban Contemporary Album. The song “Come Over” is the band’s second single off their fourth studio album, Hive Mind. The track was released in late May 2018, with the music video coming a week later in early June. The song is a smooth R&B track very reminiscent of contemporary artists Childish Gambino and SZA. Lyrically, the song is about Syd’s infatuation with a girl who may not be a perfect match or may be wrong on some things, but her confidence makes it all worth it. Syd’s vocals are smooth and soulful, and work very well with the luscious keyboard and snappy percussion. The song also features a killer guitar solo by guitarist Steve Lacy, which adds an extra rough element that is quite welcomed among the smooth keyboards and vocals. Come over and cut loose on the guitar. The music video takes place in a typical suburban house, where the band apparently lives and hangs out. We see everyone gathered on the living room couch asking people via text to come over and chill, with Syd opting to go the old fashioned way by getting up and walking over to a girl’s house where she throws pebbles at her window to get her to come out. The girl then walks by the band’s house the next day as they are practising, and calls for Syd to come out. She does, and they end up in Syd’s room. The music video then starts play with colors very well, as each band member is in a room that is a different, bold color. 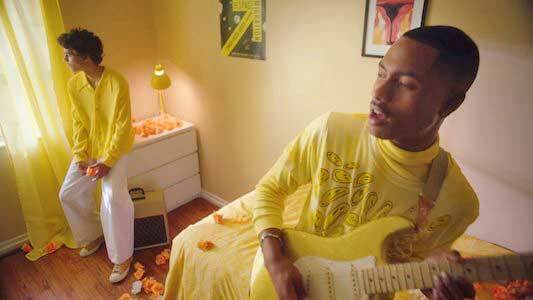 In guitarist Steve Lacy’s yellow room, there is another man who is wearing an all yellow outfit with yellow chucks. This bold choice in colors really makes the video pop and stand out from other music videos that take place in a suburban setting like this. The video is constantly changing perspective and angles during this section. Use the links below to get yourself a new pair of brightly colored chucks.